Below are the Top 5 items from the month of September. On September 18th, the NYS Department of State released proposed regulations for parking structures. This is an issue I worked on with Sen. Tom O’Mara ever since the collapse of the UHS parking garage in June of 2015. Following that incident, we were surprised to learn that while rules existed for fire and property maintenance inspections, there were no regulations for the regular inspection of their structural integrity. The proposed regulations would require on-site inspections by a licensed professional engineer and must be done at least every three years. Additional inspections may be conducted if the engineer recommends them during a previous assessment. DOS is now accepting public comment on the proposed regulations before they are finalized. You can review the regulations by clicking here and can submit comments by emailing dos.sm.codes.codedevelopment@dos.ny.gov and typing “Parking Structures” in the subject line. Binghamton University hosted the grand opening of the campus’ latest addition on August 31st. The $70M Smart Energy Building expands the impressive range of research being done at The Innovative Technologies Center. With this fourth building at the ITC, BU is helping solve one of the world’s greatest challenges: how to provide smart and clean energy. The research being done will develop new technologies and the jobs that come along with them. As communities around the globe look for new ways to provide clean, low-cost energy, BU is leading the way. SUNY Broome is also committed to workforce development. On September 21st, I joined President Kevin Drumm and Assemblyman Cliff Crouch for the groundbreaking of the Paul & Mary Calice and Mildred Barton Advanced Manufacturing Center. The center will provide unique educational opportunities for students, including food processing, fermentation science, a high-tech soldering lab, and a clean room. This new facility will help provide the skilled workforce that Southern Tier employers are looking for. 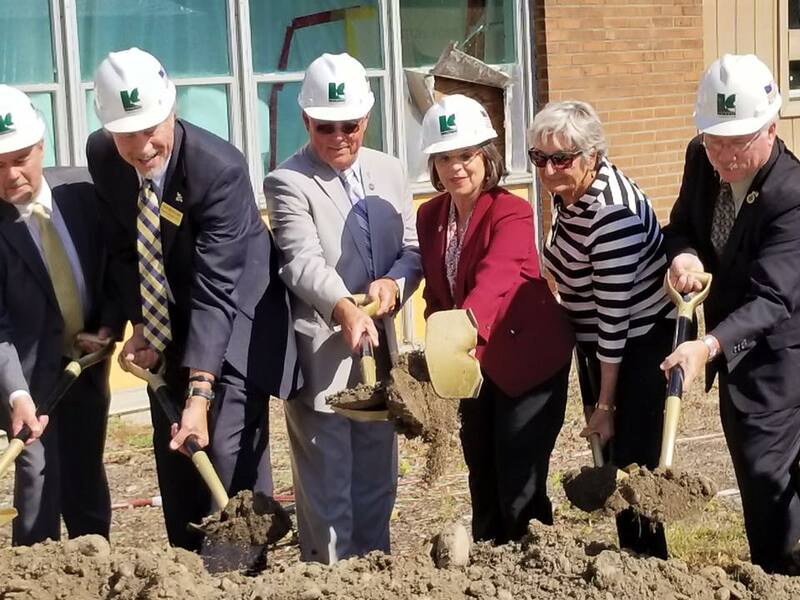 Assemblywoman Lupardo helps break ground at the new SUNY Broome Paul & Mary Calice and Mildred Barton Advanced Manufacturing Center. In my first year as Chair of the Assembly Committee on Aging, addressing all forms of elder abuse was a top priority. On September 13th, the Governor signed into law a bill I sponsored with Sen. Sue Serino that establishes guidelines for health care providers to help identify and report suspected instances of physical abuse of seniors. Elder abuse is one of the most underreported crimes and those who are abused have a 300% percent higher risk of death when compared to those who have not been abused. You can watch an interview I did with Capital Tonight to learn more about this bill. I’m continue to work on a bill I introduced that would help crack down on the financial exploitation of seniors, another common form of elder abuse. This is also highly underreported, costing seniors millions of dollars a year. The bill establishes guidelines for identifying and reporting suspected financial exploitation during banking transactions. I attended and gave opening remarks at a financial exploitation training seminar in Binghamton on September 26th. Finding common ground with all stakeholders will be a top priority of mine for the upcoming legislative session. 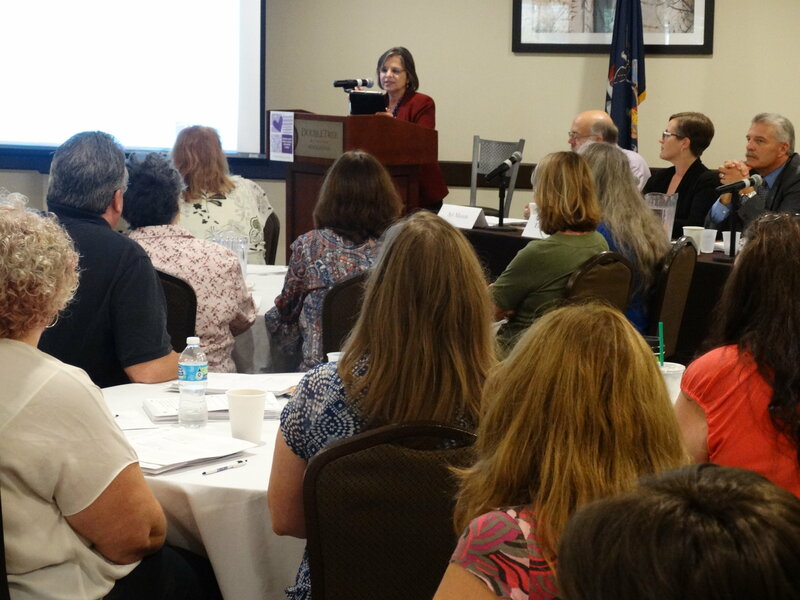 Assemblywoman Lupardo gives opening remarks at an elder financial exploitation training seminar in Binghamton. I joined Action for Older Persons on September 14th for their 50th Anniversary celebration and was honored to deliver the keynote address. AOP provides advocacy, individualized counseling, and unbiased information to help older adults and their families make informed decisions. We are very lucky to have them in our community. 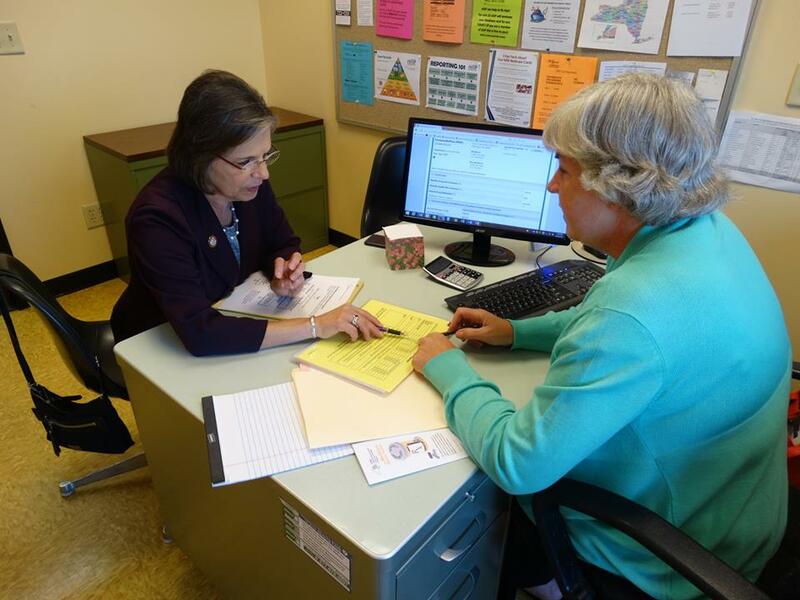 And on September 12th, I participated in a mock insurance counseling session with AOP’s Health Insurance Information, Counseling and Assistance Program (HIICAP) coordinator Jane Talbot. This important program helps seniors save money on health care and prescription drug costs by finding the right plans for Medicare recipients. With Medicare Open Enrollment approaching, AOP is encouraging Medicare enrollees to sign up for one of these free counseling sessions. To schedule an appointment or for other information, call 607-722-1251. Jane Talbot, HIICAP Coordinator at Action for Older Persons, guides Assemblywoman Lupardo through a mock insurance counseling session. As part of the 100th Anniversary of Women’s Suffrage in New York, the 1913 Binghamton Suffrage Parade will step off on Saturday, October 7th as part of New York’s Path Through History Weekend. The parade will begin at 1:00 PM at the corner of Front and Main Streets and proceed east to the Landmark Church at 126 Court St., the site of the 1913 NYS Woman Suffrage Convention. The procession will feature vintage vehicles from the early 20th Century along with women and men in period-era costumes portraying delegates to the convention, local suffragists, male sympathizers, and local elected officials of the time. A number of organizations have also signed up for the second portion of the parade which will feature groups honoring the local suffrage movement. Following the parade, a program will begin inside the church at 2:00 PM and will feature reenactors portraying important local figures from that time and period music by the Harmony Club of Binghamton. You can read more about the 1913 convention and parade by clicking here.